Facebook Data-Sharing Deals Include China's Huawei — Under U.S. Suspicion Since 2012 "Huawei worked with Facebook to make Facebook's services more convenient for users," the smartphone-maker tells NPR. "Huawei has never collected or stored any Facebook user data." Facebook's data-sharing deals with device-makers included China's Huawei — a company viewed with suspicion by U.S. intelligence agencies. 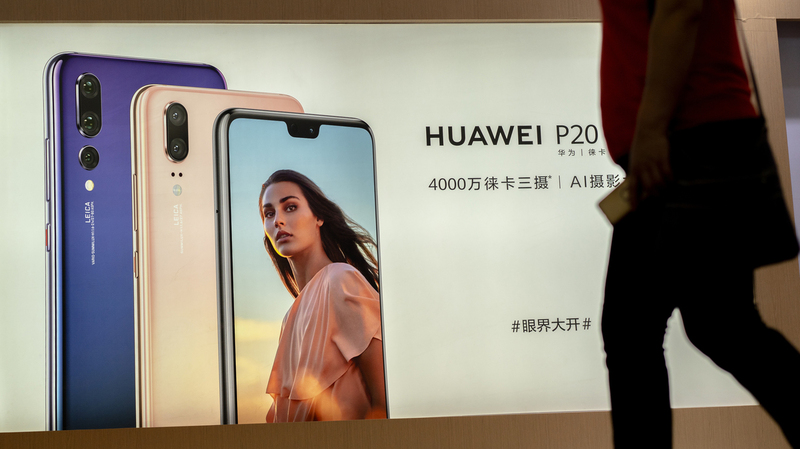 Here, an ad for the Huawei P20 smartphone is seen in China last month. Facebook's longstanding agreements that led it to share users' data with device-makers included Chinese phone-maker Huawei – a company of which the U.S. government has long been suspicious, and which intelligence officials view as a security threat. The social media company also made data-sharing deals with other Chinese companies, including Lenovo, Oppo and TCL , The New York Times reports. They're among the roughly 60 companies for which Facebook says it built private software — giving them special access to users' data so that their devices could mimic Facebook's online tools. Huawei says it hasn't misused the access, sending NPR a statement on Wednesday saying, "Like all leading smartphone providers, Huawei worked with Facebook to make Facebook's services more convenient for users. Huawei has never collected or stored any Facebook user data." In all of the data-sharing deals, Facebook built private APIs — application programming interfaces — to link the devices to user profiles and other personal information. Earlier this week, a Facebook executive said the company had "controlled them tightly." Defending itself from accusations that its data-sharing had gone too far, Facebook on Monday said, "We are not aware of any abuse by these companies." It also noted that some of the arrangements dated from more than 10 years ago, when smartphones were just emerging and the market for apps was still small and fragmented. Addressing the public revelation that the Chinese companies were included in the arrangements, Francisco Varela, a Facebook vice president, told the Times, "Given the interest from Congress, we wanted to make clear that all the information from these integrations with Huawei was stored on the device, not on Huawei's servers." Serious claims against Huawei date back to at least 2012, when the House Intelligence Committee issued a report that criticized the tech company over its ties to China's communist government (and possibly the military) and a lack of transparency. That 2012 report urged U.S. government agencies and contractors to avoid using equipment made by both Huawei and ZTE – another company that remains under a cloud in the U.S., but which has only now reportedly reached a preliminary deal to lift a U.S. Commerce Department ban on it buying from American suppliers. As news about Facebook's relationships with Chinese companies broke, Sen. Mark R. Warner, the leading Democrat on the Senate Intelligence Committee, issued a statement saying in part, "The news that Facebook provided privileged access to Facebook's API to Chinese device makers like Huawei and TCL raises legitimate concerns, and I look forward to learning more about how Facebook ensured that information about their users was not sent to Chinese servers." Facebook has long been banned by China's powerful central government — meaning that nearly all of the data involved would pertain to people outside of China. Huawei is among the top three smartphone-makers in the world, along with Samsung and Apple. The company also runs telecom enterprises, and it makes servers that power part of the Internet. In 2014, it was reported that the National Security Agency had penetrated Huawei's networks, an exploit that was seen as a bid to gather information about both the burgeoning Chinese company and some of its customers, particularly those in "high-priority targets — Iran, Afghanistan, Pakistan, Kenya, and Cuba," as the Times' David Sanger told NPR at the time.